Why the scales are so tilted in Labour’s favour? In spite of the aftermath of the Iraq War, a sharp decline in personal popularity for Tony Blair, and poll ratings for Labour that are 10-15% below where they were at this stage before the last General Election, we continue to CALL LABOUR for the General Election. At the heart of this is the UK’s electoral geography and this is going to play a huge part as we approach polling day – expected to be on 05-05-05. LAB 364 seats: CON 224: LIBD 43. Kellner identified the following factors. 13 extra Labour seats because of over-representation at Westminster of Scotland and Wales which have on average 55,000 and 57,000 electors per seat compared with 70,000 in England. The Scottish anamoly will be changed at the General Election but not Wales. 8 extra Labour seats because they have on average 6,000 fewer electors than Conservative ones because boundary changes have not kept up with population movements. 10 extra Labour seats in relation to overall votes cast because turnout is 6% lower than in Tory seats. 28 extra Labour seats at the expense of the Tories because of anti-Tory tactical voting in their target constituencies. All the above are based on Labour and the Conservatives having the same share of the national vote and the Lib Dems retaining the vote share that they got last time. Apart from Scotland, which is being changed, almost all the factors identfied by Peter Kellner remain. The key area that could change is tactical voting. Will it continue as last time or will Lib Dems vote for their own party or even the Tories? Could it be, even, that there is anti-Labour tactical voting. Could we have a mixture of all of them? This is a hard one to call. Even if all 28 tactically-vulnerable Labour seats went to the Tories that would cut the difference between the parties by 56. Add in the 9 lost Scottish seats and that reduces the gap to 85 which is still a mountain for the Tories to climb. We are not convinced that many Lib Dem seats won with a tactical element will switch. But Labour could be vulnerable to anti-Labour tactical voting where Tories vote Lib Dem in Labour’s heartlands. Taking everything into account it’s hard to reduce the structural gap to below 75-80 seats which is equivalent to a Labour vote lead of 7%. That is why our strong LABOUR CALL remains. The issue is not the outcome – but whether you can get a good price on Labour. Last week William Hill had Labour at 1.4 until we pointed it out as good value. It will probably slip back. WHITE HOUSE RACE – LATEST POLLS. The CBS News/New York Times Poll has personal ratings for George Bush stlil languishing at just above 40%. Our KERRY CALL remains. Latest prices. Labour overall majority at under 51.5 seat DOWN from 2.5 to 1.9. Thus for most of yesterday you could get 3.5 on the Tories getting 245 seats – which was exactly the same price as Bet365 was offering on them to win the General Election for which they needed at least 50 more seats. That was a no-brainer. All these were good value bets – but now they are much less so particularly as you would be locking up your money for nearly a year and a lot can happen in the intervening period. Meanwhile the conventional bookmakers such as William Hill and Ladbrokes have made no secret of their hostility to the betting exchanges where gamblers can be both backers and layers and the prices are determined by punters matching up with one and other resulting, usually, in better value odds. The bookies have tried political pressure, a PR war and now, in the political markets at least it seems, more aggressive pricing. Further indication of this is that William Hill are now offering 1.83 on George Bush to be re-elected – odds that put them ahead of all the other online bookies and the betting exchanges. This means that for the odds-on favourites in the three biggest political betting markets – the UK General Election, the US Presidential election and the Labour Leadership – William Hill have a significant price advantage over the betting exchanges, which if you read their blurb, should not be. On Thursday we recommended that punters took advantage of the 1.4 that William Hill had on Labour for the General Election; the following day the bookmaker was beating the exchanges with its 1.53 price on Tony Blair still being Labour leader on General Election day; and now comes the George W. Bush price. After our recommendation the Labour General Election price has slipped back to 1.36 but William Hill still leads the pack and is offering better value than Betfair, and that is without taking into account the 5% commission on winnings that Betfair charge. We do not know whether this is a deliberate strategy by the bookmaker but a pattern has now become clear and it has only emerged in the past week or so. The bookmaker seems to have chosen to be highly competitive on price in long-term markets where betting exchange prices can be unresponsive because many punters are in for the short-term not the eventual outcome of the market. When circumstances change many exchange gamblers do not look at the overall picture – just whether they can turn a profit on their short-term positions. What this means is that in these long-term markets bettting exchange punters might have to take a slightly worse price on the exchanges so they can have the flexiblity, the ability to punt on short-term price movents and the potential to get out of a market easily. Whatever the competition is good news for punters. The biggest betting opportunity this week comes from the online bookmaker Bet365 which has opened three new General Election markets at prices that are out of alignment with what is available elsewhere and, indeed, what it is itself offering in other markets. Just compare their prices with the current Commons seats spread betting prices – which we believe represent a fair current reflection of what is likely to happen – Tony Blair to be returned but with a much smaller majority. The best value from Bet365 is Conservatives to win 245 seats & over – 3.5. To underline how far out this is the bookmaker is offering exactly the same price on the Conservatives winning most seats at the General Election – and for that they will need about 290 seats or more. The 245 figure is also below the top of the spread betting range. At this price a winning £100 bet would produce £350 including the stake. BET NOW before this is taken off the market. To achieve a majority of 51.5 Labour needs to win 350 seats which, based on current evidence, looks very challenging. The top of the spread market, 340 seats, is equivalent to a Labour majority of 32. On the main market – the 1.4 from William Hill, which we recomended on Thursday, on Labour winning most seats has now been cut to 1.36 but is still the price leader. A good feature by Andrew Rawnsley in the Observer asking the question – “Has Gordon Brown blown his chance?” should be looked at by all who have an interest in the Labour Leadership and Still Party Leaders markets. It’s very hard now to bet against Tony Blair and William Hill’s 1.53 on him being there on election day looks good. As of the time of posting the Betfair price on Blair has just nudged ahead – but remember that you have to pay upto 5% commission on your winnings. No bookmakers are yet offering markets on Leicester South and Birmingam Hodge Hill. At the last general election in Leicester South, Labour came first with 22,958 votes, Tories second with 9,715 and the Lib Dems third with 7,243. In Birmingham Hodge Hill in 2001 Labour won with 16,901 votes, the Tories again came second with 5,283 and the Lib Dems third with 2,147. The biggest weakness in our CALL on JOHN KERRY has been money. In a national campaign where TV advertising plays a huge part we were worried that George W. Bush has so much at his disposal that the Kerry campaign was going to be obliterated. This has been eased by an examination of the campaign financing by the New York Times that suggests that although Kerry still has less money than Bush he is attracting the tens of millions of dollars that are going to be needed to keep his message in front of the US electorate in the countdown to November 2. This is good on two counts: it shows the depth of support Kerry has and it means he has the resources to sustain the campaign. The polls are showing a mixed picture of Kerry’s position in relation to Bush. But the President’s approval ratings continue at below 50% – and this, we believe, is the significant indicator. Prices in the UK remain attractive with 2.1-2.25 on Kerry being possible. NOTE: When we make a call we are stating that we believe that the chances of something happening are better than the odds that are available. All prices quoted are as at time of posting. We endeavour to ensure that material is accurate when posted. However Politicalbetting.com can accept no respnsiblity for the information on the site or opinions expressed. Users make bets entirely at their own risk. Can Labour hold on? Can the Tories show that they are on the way back? Can the Lib Dems jump from third to first? When will the betting markets open? This weekend huge numbers of Tory, Lib Dem and Labour party activists from all over the country will be heading for Leicester South where the parliamentary by-election has been set for July 15. Michael Howard has already become a frequent visitor. This will be a tough three-way fight and the outcome could have a big effect on UK politics in the countdown to the General Election. The Tory and Lib Dem campaigns have been made harder by the decision to to hold on the same day as the Birmingham Hodge Hill by-election – a seat where Labour was in an even stronger position in 2001. The bookmakers have yet to open up markets but we are sure that they will because this is a seat where there will be a huge amount of betting interest – not least from the party activists themselves. This is how the votes split in 2001. The Case for Labour is that at the last General Election they held it with a huge majority; they have a popular and very well-known former leader of the city council as candidate; and the opposition to them could be split between the Lib Dems and the Tories. CHANCES OF WINNING 30%. The Case for the Conservatives is that they have won the seat before – by just seven votes in Margaret Thatcher’s landslide General Election victory in 1983. They were well ahead of the Lib Dems at the General Election; they are 4% ahead of Labour in the national opinion polls and the party organisation has been rejuvenated under Michael Howard who is putting his reputation on the line with this fight. But they have no by-election “form” and even the most ardent loyalist would find it hard to tell you when they last gained a seat. CHANCES OF WINNING 25%. The Case for the Lib Dems is that they won 46% of the votes in the local elections there last year which reflects a good organisation. This will make it much easier to present themselves as the only way of beating Labour – the standard Lib Dem stategy. One prediction’s for sure – their leaflets will present the election as a “two horse race” – it’s worked before so why should it not work this time? The Lib Dem opposition to the Iraq war has made them them popular within the large Muslim communities; and when it comes to fighting by-elections they are by far and away the “form” party. CHANCES OF WINNING 45%. And the United Kingdon Independence Party? CHANCES OF WINNING 0%. Strangely it won’t be fielding a candidate even though Leicester South is within the East Midlands – the region where it had its best performance in the Euro Elections. Lack of money is blamed – which seems odd, as the commentator Anthony Wells has pointed out, given that the party leader, Roger Knapman said this week that they “had a financial warchest unparalleled in British history“. Maybe they don’t want to risk coming in a poor fourth that would take the gloss of their Euro Election performance. But getting 10% of the vote, surely, would still have kept them on the map? After yesterday’s move by William Hill to offer the best price on Labour for the General Election the bookmaker is beating the betting exchanges in another key General Election market – whether Tony Blair will be Labour leader on election day.? The mood has moved back to Blair in recent weeks and this has been reinforced by comments from Gordon Brown that the Prime Minister would stay until the Euro referendum at the earliest. This looks set for 2005 – or after the General Election. The Willian Hill price of 1.53 is ahead of Betair – which does not usually happen. For many political gamblers the exchanges offer other advantages but it is striking that on the two key political propositions – Labour to win and Blair to be leader – they are behind. Before placing any bets it always pays to check what’s happening across the markets. Labour has called two quick by-elections in Midlands seats where it had huge majorities in 2001. At the last general election in Leicester South, Labour came first with 22,958 votes, Tories second with 9,715 and the Lib Dems third with 7,243. In Birmingham Hodge Hill in 2001 Labour won with 16,901 votes, the Tories again came second with 5,283 and the Lib Dems third with 2,147. We think that Leicester South looks like the interesting battle and let’s hope we can bet on it. There’s been no clarification on the Scotland boundary changes so punters BUYING LABOUR will almost certainly find that they are at least ten seats short because the overall House of Commons is being reduced by 13 MPs from Scotland. We would be urging punters to take advantage of this by SELLING LABOUR – but even with the 10 Scots seats factored in we do not see value in the current spread price. Only if punters are planning to BACK the TORIES anyway would we suggest the SELL LABOUR option. Paddypower has now weighed into the the “who will be next EU President” market and marks the Irish Premier, Bertie Ahern, as strong favourite. This is a crazy one to follow because of the ability of the big powers to exercise their veto. We have no view. Labour eases to 1.4 – is now the time to bet? Moves against Labour on the General Election markets have seen the price go to 1.4 with William Hill, which has almost certainly got the biggest book and reflects money going on the Tories. This is the best value on Labour for a very long time and now might be the time to bet. To underline the value of this price punters should note that of the £306,000 that’s been matched on Labour in the Betfair betting exchange General Election market just £62 has been at prices at more than 1.4. At the time of posting the Betfair price is 1.34. At the William Hill price a £100 winning bet produces £140 back including the stake. As we have said repeatedly it is very hard to see how Labour is not going to end up with most MPs at the General Election because of the way the seats are distributed. Michael Howard needs to be getting consistent poll leads of at least 6% on YouGov before there is any doubt at all on the outcome. The Tories are a long way off that. The real issue for political gamblers is not the outcome but the price and 1.4 looks very good to us. The move in the Lib Dem spread follows our BUY CALL last week when the price was on 58. If the party takes Leicester South at the coming by-election then we would expect to see this spread to rise further so the BUY price of 60 is still a value bet – just. But the confusing part of the new prices is that the Conservatives have declined by 2 seats whereas the Lib Dems and Labour have, between them, gone up by 4. Taking into account Northern Ireland and SNP/PC seats it appears that the spreads are working on an inflated House of Commons with 661 seats not 646, 13 of which are accounted for by the changes in Scotland. Is there are profit opportunity created by the spreads working on the basis 15 MPs more than will be elected at the next General Election? This has most impact on the Labour spread price which would seem to include the 10 seats that the party will lose as a result of the boundary changes – which as we pointed out in April have not been factored in by the spread betting firms. Our advice is to be very wary of a BUY bet on Labour until this is clarfied. With just one MP in Scotland this has almost no impact on the Tory spread. If the Labour trend continues to rise then with the 10 seats that are going anyway we might reach a stage where a SELL bet becomes good value. We are probably about 4 seats from that point. Where’ve the opinion poll protestors been since 1992? For nearly a decade and a half the opinion polls have had, when tested against real General Election results, an average pro-Labour bias of 6.5% and there’s been hardly a whisper from Labour MPs. 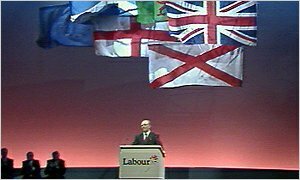 The bias led to political gamblers making huge errors and losses at the 1992 General Election in which Neil Kinnock, above, made what amounted to a pre-election victory speech a few days ahead of his own party going down on votes by 8%. Now, for the first time since then, we have a pollster showing a bias to Labour that’s down to 2.1% and large numbers of Labour politicians are protesting in an ongoing campaign. Ostensibly they are focussing on an over-estimate of 4.9% in the Euro Elections for UKIP, but is their real concern that what has been a given of British politics for so long – the pro-Labour bias of UK opinion polls – is no more? The essence of their position would seem to be that it’s OK for the polls to consistently over-state Labour by 6.5%, but not to make errors of 4.9% with other parties. What pollsters report, particularly in the run-up to an election, has a huge effect on the voters and it is not always the party that’s reported to be in the lead that benefits. Would Kinnock’s Sheffield speech in 1992 have happened if there had been accurate polls? The pollsters’ embarassment was saved by the distortions in the Commons seat distribution that left Tony Blair with a 165 majority even though his vote share was down significantly. Figures that are just plain wrong help nobody and it is not just political gamblers who have got an interest. That is why the recent comments have made such depressing reading. They seem to be attacking some of polling firms because they are not reporting what they want to hear. The internet pollster YouGov has come in for stick and there is little doubt that it is not as good at predicting vote shares for the smaller parties than it is for the Conservatives and Labour. The UKIP figure was an exaggeration and YouGov seem to record the Lib Dems at much lower levels than the other polls or much higher. But for the first time in a decade and a half political gamblers have a proven and reliable guide to how the main two parties are doing. Let’s be thankful for this and be just a bit wary of the pollster’s figures for the Lib Dems and the smaller parties. US ELECTIONS UPDATE. The latest polls show big leads for John Kerry. This follows some recent polls showing a Bush recovery and has happened in spite of a huge anti-Kerry ad campaign by the Republicans. The latest prices have him at 2.1 or 2.2. For some reason the Iowa price has taken a steep drop. Our call is BACK KERRY. Four years ago we backed George W. Bush at substantially better than evens to win the 2000 White House race because we felt that he had more voter appeal to many Americans than Al Gore. As it turned out we should have lost that bet but we didn’t. Now comes the opportunity to bet on him again but we are not sticking with Bush for the same reason – we do not think he has the voter appeal. We take this view in spite of one or two recent opinion poll improvements for the incumbent and the fact that bad news from Iraq is not having quite the same impact on domestic US opinion as it was a few weeks ago. But what convinces us that John Kerry is still in with a good chance are the favourability polls on George W. Bush. The president is still finding it difficult to get above 50% and many commentators are observing that no incumbent who has dropped below 50% in his personal ratings in an election year has managed to hold on. One factor that looked promising was an opinion poll showing that a John Kerry – John McCain ticket would beat Bush-Cheney by 53%-39%. Since then the option of a leading Republican joining Kerry on a bipartisan tickets seems to have been ditched and the hot Vice-Presidential favourite is John Edwards – the telegenic Senator from North Caroline who did so well in the primaries. This option has polled almost as well as McCain and there’s little doubt that the young former trial lawyer will bring a real edge to the ticket. The V-P choice is critical because a factor to hurt John Kerry has been the candidature of Ralph Nader who is in one or two surveys polling 6-7% . A good indicator of betting value on US political markets is the Iowa Electronic Exchange – which we’ve featured before on Policalbetting.com. The latest Kerry price is the equivalent of 2.13 – so just slightly better than evens and a touch lower than the best UK price. The Iowa markets is not on who wins but, bearing in mind what happened in 2000, who gets most votes. Bush’s poll recovery has pushed the Kerry price out and you can now get more than 2.2. This should drop after a successful convention in Boston next month. BACK KERRY. Next month’s Democratic Convention on his home turf in Boston will provide the ideal platform for Kerry. It will provide a sharp contrast with the Republican Convention in August in New York. The city was chosen by the Republicans so they could launch their campaign with a sharp reminder of 9/11. We think that this might back-fire because it could be seen as a cynical political move to exploit what happened. LABOUR LEADERSHIP UPDATE. Comments by Gordon Brown seem to give a firm indication that Tony Blair will not be stepping down prior to the General Election and will stay on, at least, until the referendum on the EU constitution. This is about as clear as you can get and reinforces our call not to bet against Blair in either the Labour leadership or “Still Party Leaders” markets.